The Comet: Best lesson ever! Yesterday was a warm and sunny day, and me, Liss and Sophie started it by going up in the air with a balloon. 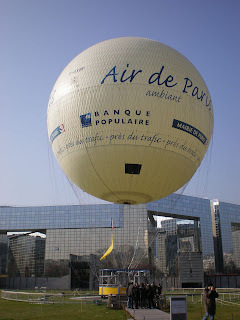 There's somekind of environmental week going on here in France, and therefor I happened to see in the newspaper that the rides with the balloon were free. But it turned out that it wasn't actually a real hot-air balloon, only a small balloon that remained attached to a cable the whole time. 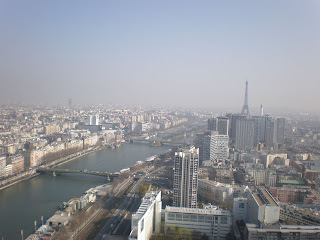 But the view was till magnificent! 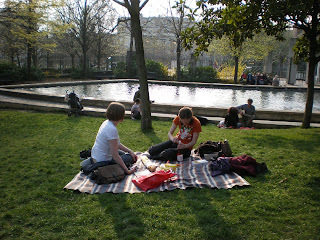 In the evening we then went to have a picknick in a small park called "Parc de Belleville". It was a lovely and quiet small park, not at all like the bigger parks in the city center. Those are always crowded and with a lot of noice. And you're not allowed to sit on the grass! Which is stupid. You can't have a real picknick sitting on a bench! So that's why we were really happy to find this park near where Liss lives. And even though we went there something like 6 in the evening, it was still so warm outside that we could sit there in the sun with only t-shirts! There we sat for a couple of hours, drinking rosé wine and eating grapes and baguette with french white cheese and ham. And cookies for dessert. 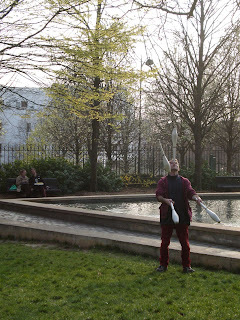 Behind us, as you can see on the picture, sat also a guy who played the guitar and later on he was also joined by another guy who started practising juggleing. So at least we were not short of amusement! Oh, siellä on ihan kesä! Lähettäisitkö tännekin epävakaiseen kevätsäähän vähän lämpöä?